Human behaviour is something that most designers strive to influence. Design drives emotions and it also drives one’s senses to act in a way that could be guided to bring about a fertile environment maximising customer engagement, brand connect and eventually make a purchase decision. Human behaviour always varies dependent on the kind of space one is in, thus a space can make you feel extremely energetic or extremely cold depending on what forms, materials, colours, patterns etc are used to build it and in the recent times we have seen a lot of brands develop a distinct blend for themselves using these elements as the key ingredients. In the case of True Blue I-AM, inline with the brand positioning, created a very warm space with subtly textured walls, infusing traditional indigo shades colours along with jaali patterns to bring in the ancient Indian weaves and fabric prints in physical space. All these elements, along with complimentary lighting, smell, virtual engagement and a balanced use of technology create a space that becomes the core of a holistic brand experience that could differentiate one brand from the other. Now, is this only restricted only to physical space? I would say it isn’t… and the reason is social media. It drives a lot of our everyday activities, choices, likes and dislikes and is today a powerful extension to the physical realm of the brand. 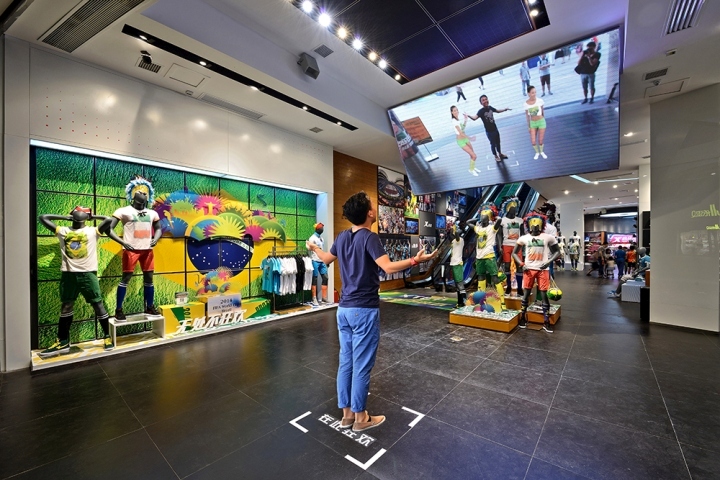 The Virtual environment becomes a tool that can escalate and extend the experience of the customer even after they depart the physical space. This experience stays with him no matter where he goes and by doing this, the brand becomes part of their daily lifestyle, and they become advocates for the brand. Human behaviour is malleable but while we do this, one needs to be careful that they are ethical at the same time to do justice to the customer.